Season 3 knocked our socks off with its increased production values and deeper, more exciting sci-fi and action-oriented stories. Now season 4 kicks off with Picard covered in mud and crying for his mommy. Huh? Can this radical new direction possibly lead to happy returns? Post-collar, post-Wesley, pre-Chunky Riker. That can only mean one thing - it's Season 4! 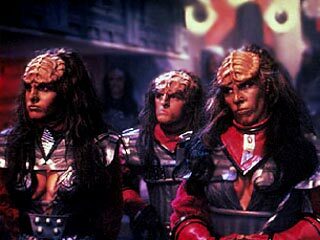 The Enterprise is called upon by Gowron, who awaits his installation as the next Klingon chancellor. It seems he is worried about a budding Klingon civil war, instigated by the surviving members of the Duras clan, whose leader Lieutenant Worf had killed in revenge of his wife. Worf sees an opportunity to set right the wrong that had been inflicted on his family's honor... but Picard worries that the Enterprise's presence might leave it inextricably mired up in a violent political morass. Lursa and B'Etor argue forcefully for leadership of the Empire to be split between four equally awe-inspiring entities. The Enterprise is tasked with charting the Mar Oscura, a dark matter nebula. While exploring the nebula, Data begins exploring another uncharted realm, romantic relationships. As the relationship begins to grow more serious, the Enterprise begins experience strange phenomena inside the nebula. Furniture is mysteriously jumbled in empty rooms, and parts of the Enterprise's hull seem to momentarily vanish. Data makes out with Jenna, in the hopes that things will eventually move down to the torpedo tube. En route to Risa, Geordi's shuttle is accosted by a Romulan Warbird. The Romulans have designs on turning Geordi into a "sleeper agent" who executes secret instructions. 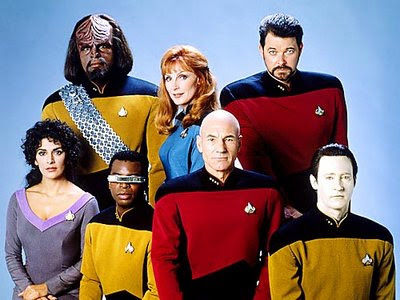 The crew of the Enterprise now must try to unravel the mystery and discover what has happened to Geordi in time to prevent him from assassinating a Klingon dignitary and plunging the Klingons and the Federation into war. 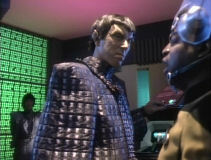 Silik interrogates Kunta Kinte as Tasha Yar looks on. Waaaah?!?! The Enterprise is ferrying a Trill ambassador to Peliar Zel to mediate a dispute between the inhabitants of two populated moons in orbit. Doctor Crusher, working with him to prepare him for his task, begins to fall for him, and they begin a passionate relationship. When an extremist faction attacks the ambassador's shuttle, the ambassador is critically wounded, and Doctor Crusher discovers a startling secret. Now she is faced with difficult task of saving his life, and reconciling what she has learned with the man she thought was falling in love with. 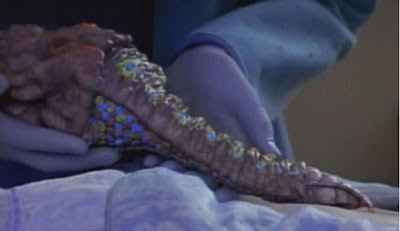 Pictured: Dr. Crusher massaging Odan's glistening shaft. The Enterprise visits the reclusive world of Kaelon II in order to help one of its pre-eminent scienctists in an attempt to re-ignite the planet's dying sun. The visiting Lwaxana Troi complicates matters when she begins to romance the scientist, and uncovers his planet's deadly secret - all of its citizens must voluntarily commit suicide when they reach the age of 60. Even at 60, a woman can look fabulous enough not to execute! Two startling incidents, an accident involving the warp core and the discovery of a Klingon spy on the Enterprise, spur Starfleet to bring famed investigator Admiral Nora Satie out of retirement to get to the bottom things. 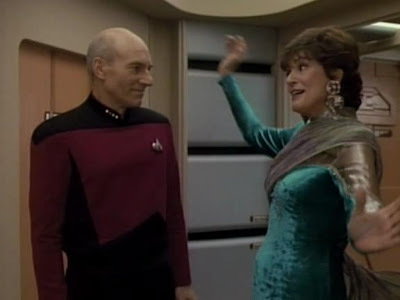 Initially, Picard is honored and pleased the Admiral, the daughter of a famed Federation jurist, is abord. But her investigation quickly spins out of control, finding conspiracy theories around every corner. The Admiral begins to suspect everyone on scant evidence, threatening all their careers. Even when faced with proof the damage to the warp core was merely an accident, she refuses to stand down. Will the crew be able to weather this latest crisis from such an unlikely source? 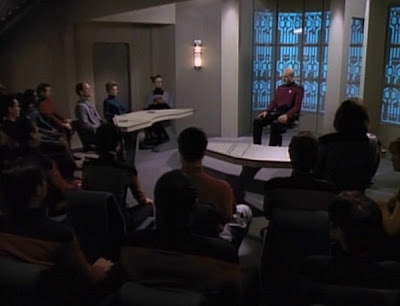 Picard's one-man reading of "A Christmas Carol" receives some unwanted attention. While preparing for a keynote address to the Federation Archaeology Council, Captain Picard is surprised by two unexpected guests. The first, Vash, is a pleasant surprise. The second is not as welcome -- Q. 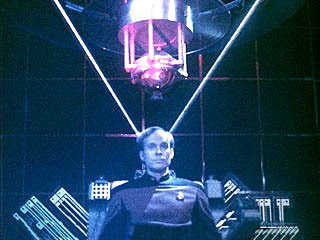 The Enterprise is tasked with fixing the Argus Array, a massive subspace telescope on the border of Federation space. 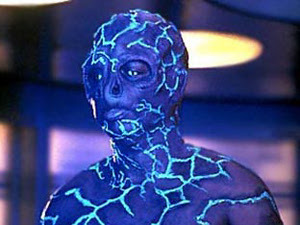 The Enterprise quickly finds the cause of the malfunction, a mysterious alien probe that manages to disable any computer system it interacts with. Investigating by shuttle, Cmdr. LaForge and Lt. Barclay are scanned by the probe. The shuttle is disabled, and Barclay suddenly begins to transform into a more confident, capable version of himself. How far will the transformation go? What will happen to the Enterprise as a result? People, it's got frickin' laser beams in it. There's not much more to be said. Geordi has occasion to reminisce about his time on the USS Victory, when his old friend, Lt. 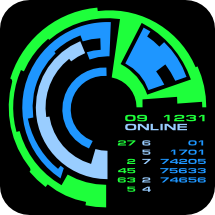 Commander Susanna Leijten, visits the Enterprise, investigating the disappearance of several of their former colleagues. Things go from mysterious to frightening when Leijten undergoes a sudden and dramatic physical change, and tries to lose herself on the deserted colony that the Victory had visited. 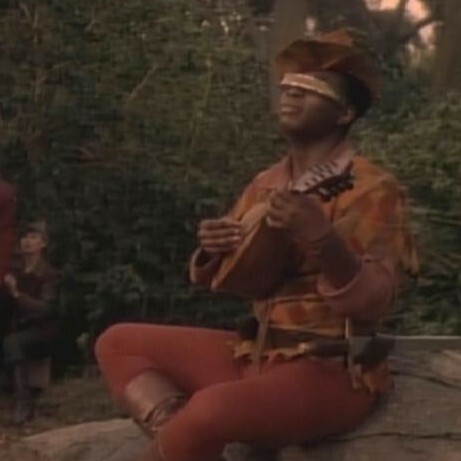 Will Geordi be able to unravel the mystery before he undergoes the change and loses his identity? Woo hoo! I finally got out of the VISOR. Oh wait... Crap!